It’s A Secret – Don’t Tell Anyone! 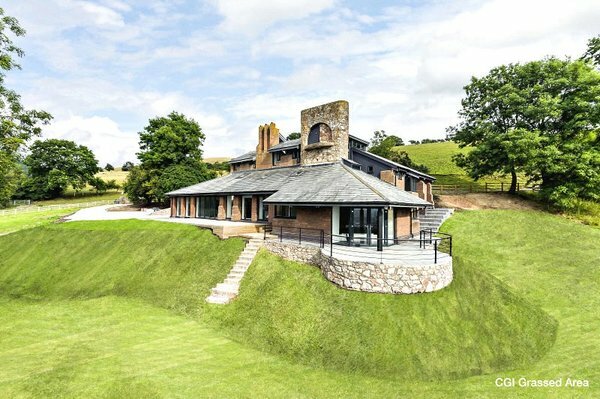 This Unique Property Bulletin finds some properties coming up for sale that even the owner’s estate agent doesn’t know about yet! Our feature article for this Bulletin advocates one of the main principles behind what we do here: whenever possible we like to give readers as much advance notice as practicable for truly unusual properties that are soon to be placed for sale. Extra time gives folk the grace to sort out due diligence, finance, visits to the area to establish suitability etc. In essence, a vital edge for buyers. A potent thing when you want to ensure your chances of a successful purchase are maximised. It shouldn’t surprise us, but when we revisit the methods in our handy Unique Property Manual goodies still appear. If proof were needed, we present one of several lighthouse buildings that have been decommissioned and will be coming up for sale. This news is so fresh, even the estate agent handling the sale does not yet know about it. How can this be so? Check out the feature article at the lower part of this edition of the Unique Property Bulletin. It is also worth noting that the techniques in our Manual cover the A to Z of unusual property styles. Not just lighthouse buildings, but air control towers, barns, castles distilleries, fire stations, islands, railways stations – the whole spectrum right to the end of the unique alphabet – zoos! Church of Saint Luke, Buckley Street, Chadderton, Oldham, OL9 9HU. We start the listings element of this Bulletin featuring a large detached, former church with approximately 6,367 square feet of internal area. Around £19.64 per square foot it represents a lot of building for the price. Also guided as “offers in the region of” – four favourite words as, of course, they mean there might wriggle room on negotiation. The external masonry is mostly stone, under a traditional slate roof. Internal headroom is an exceptional 50 foot to the nave. 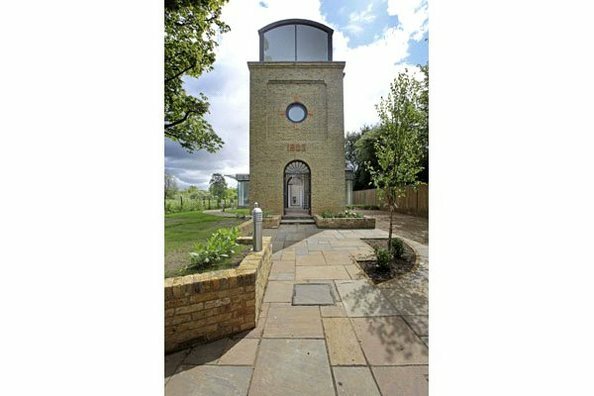 Located in an established residential area, the former church of Saint Luke may be suitable for residential conversion, subject of course to planning permission. Originally built around 1883 this impressive structure has remained relatively unaltered since it construction. 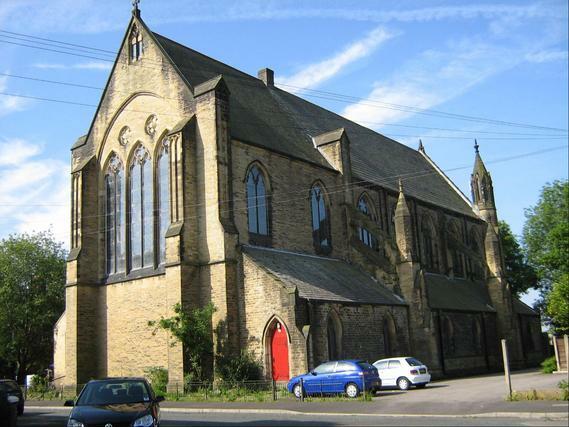 Location: Church of Saint Luke, Buckley Street, Chadderton, Oldham, OL9 9HU. Guide: Offers in the region of £125,000. Archived Details For Future Reference: Click Here. Contact Dunlop Heywood Tel: 0161 817 4840. Please can folk mention to estate agent that they found this place for sale in Unique Property Bulletin. This helps us keep this publication free for all readers. Dreaming of A Country Pile? How About A Neat Pile of Bricks With Much Potential? A challenge we could not resist. So after a good old search using as many of our property sleuthing protocols as possible we have a candidate. Well what might best be described as a neatly stacked pile of bricks with some slate tiles added into the bargain. Still, we managed to tick several boxes. Under £30,000? Yes. By the sea? Yes. A beach? Certainly. Boat included? Not so sure you will have time to go onto the water as there is quite a lot to do to renovate this beach home. 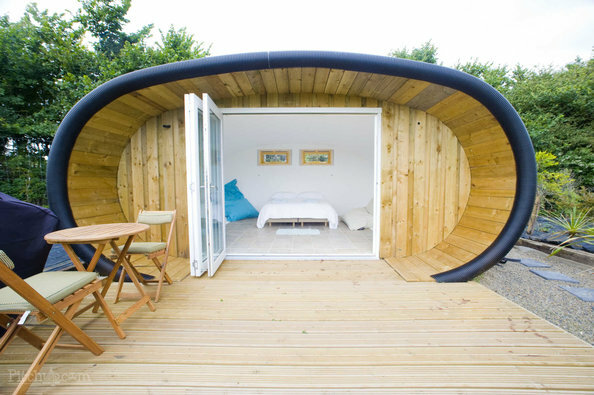 An idea for temporary accommodation might be to add something like this camping pod – subject to planning – onto the half acre of land that is included in this property sale. It might make for an decent piece of accommodation until the beach house is restored. Then it could be used as a source of income for letting out as holiday accommodation for visitors once you move to the main house. These types of pod seem very popular for this type of recreational use. Pod House Not Included But Worth Adding Until Main House Renovation Complete. 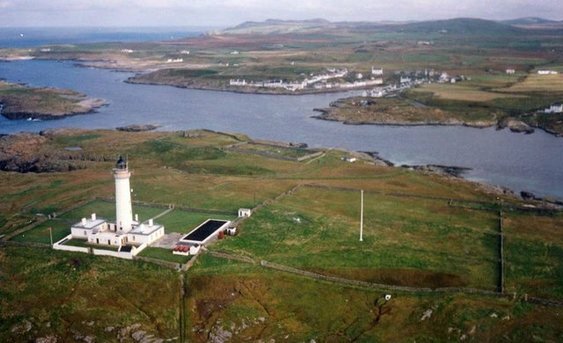 Before you dismiss this as on an island and remote, it is worth mentioning that there is a very civilised, and none too crowded airport just two miles and 6 minutes drive: click here. In fact once you take off, you can see how truly beautiful this place is…. Hopefully we have answered the challenge put to us by one of our readers? Or at least provided some food for thought. Further Details & Interesting Interior Pictures: Click Here. Contact Lows Estate Agent Tel: 01856 873 151 – Mr Andrew Bonner. Please can folk mention to estate agents that they found this place for sale in Unique Property Bulletin. This helps us keep this publication free for all readers. We are tweaking the new monthly format of Unique Property Bulletin so that readers instinctively know when a new edition is scheduled. Starting from now, each individual Bulletin will be on the first Sunday of each month at 9pm. This edition will cover 24th January 2016 to the end of February 2016. The next one shall be on Sunday 3rd April 2016. Please remember this new monthly format runs alongside our new effort to add a unique property for sale every day onto our new Facebook (here) and Twitter (here) accounts. 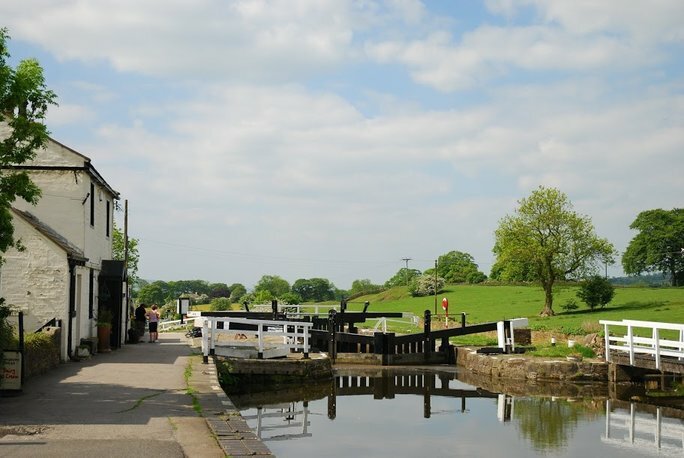 Original Purpose: The Lock Gates and Canal Traffic. The property has been modernised throughout. A nice set of interior photographs can be studied via the estate agency links below. 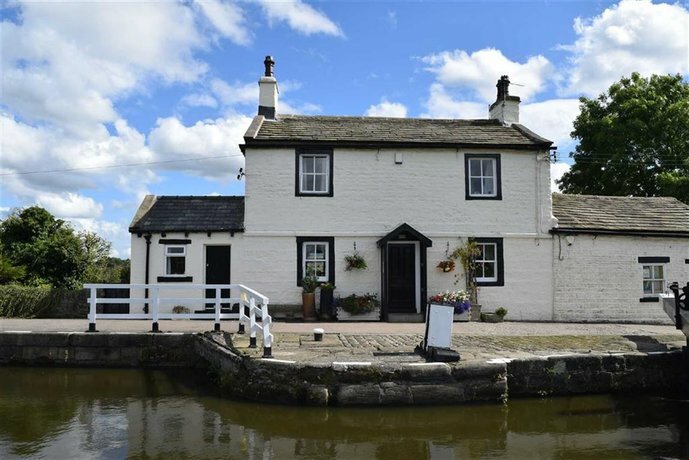 A previous owner had an income producing lifestyle by selling books and ice cream to folk walking or canal boating along this beautiful stretch of country. 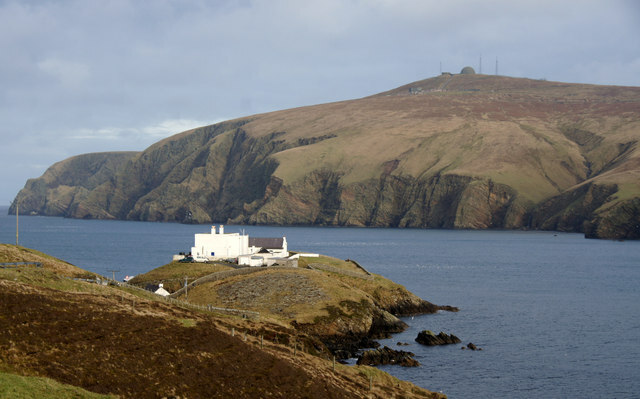 I know from personal experience living at the Davaar Island lighthouse keeper’s house that lifelong friendships can be forged this way. It may seem a simple thing, but many an interesting person passes by your door. At the sedate speeds of walkers going by, you have the grace of time to spend a while with folk. So the delights of this style of life can be very enjoyable and sociable. Contact Petty & Co., Estate Agents Tel: 01282 615900. Please can folk mention to estate agent that they found this place for sale in Unique Property Bulletin. This helps us keep this publication free for all readers. Railway Street is situated close to the centre of the historic town of Bridgnorth. A short way up this road is the innocuous looking Dracup’s Cottage. Seemingly an ordinary home, it contains something so unusual that has captured national media attention. In fact it was one of the Bulletin’s American readers who emailed this in to share. Previous owners of the cottage have lovingly embraced the work of former owner and local artist Mr Anthony Dracup and have kept alive the unique character and features integral to his art work. 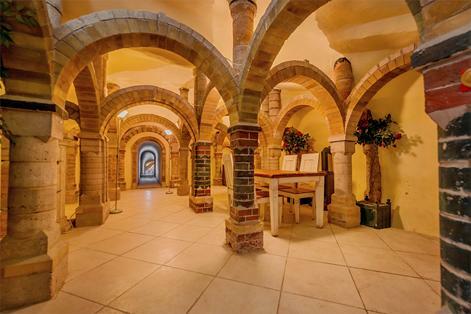 The key element is the wonderful cave which forms a stunning lounge/ living space with ornate vaulted pillars. Additional ground floor accommodation comprises front reception room, family bathroom/ WC, kitchen area and a dining room. To the first floor there are two bedrooms, one of which provides access to the loft room. 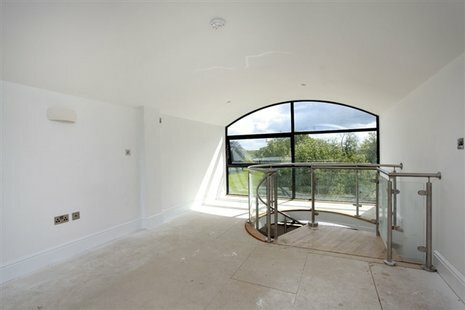 Leading off the landing is a terraced roof garden with spiral stairs rising up to a landscaped garden enjoying spectacular views across Oldbury Wells. There is parking on Railway Street. 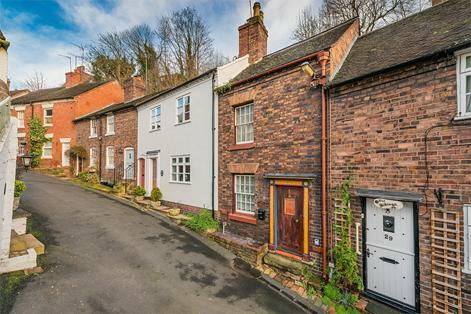 The ancient market town of Bridgnorth is geographically divided into High Town and Low Town, linked by several sets of historic steps, the famous cliff railway and by Cartway, a meandering street steeped in history. The local area enjoys excellent amenities including high street shopping, supermarkets, a wide range of leisure facilities, doctors and dentists. Google 3D 360 Degree Interactive Streetview: Click Here. Contact Nock Deighton Estate Agents Tel: 01746 767 767. 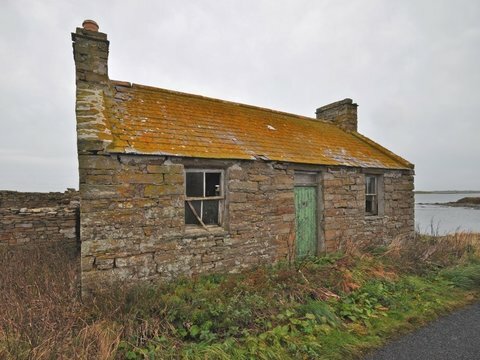 Please can folk mention to the estate agent that they found this place for sale in Unique Property Bulletin. This helps us keep this publication free for all readers. The Bulletin has always extolled the unusual. Normally this means just writing about buildings and homes that are interesting. However, it can be irresistible when narrating details of these amazing properties – then just stand idly by. The deep felt desire to join in can be compelling beyond words. So that is what several of is did in 1998 and have been enjoying the process ever since. The first phase of syndicates between 1998 and 2001 was outwith anything we could have possibly imagined. 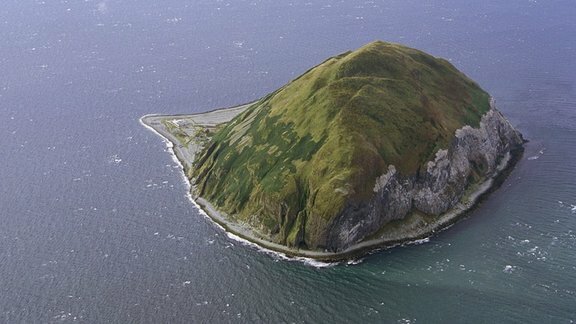 Also, we just wouldn’t have managed some of the genuinely exceptional acquisitions further down the line – such as at Ailsa Craig island – were it not for the collegiate group profits generated by this strange sounding phenomenon of unique property syndicates. The net profit from this £258,672 was distributed directly from the syndicate solicitors to each syndicate member on a strict pro rata amount, depending on how much each participant had sent the solicitor in the first instance. Plus there has been a great deal of fun along the way. …needed to go ahead. That is after just 19 days. If you ever find our main Unique Property Bulletin website is offline, please note we have a safety backup located at an entirely separate webserver to ensure you can always get the details from the Bulletin. Hopefully this makes sense? It may be old fashioned, but we always like to have the safety of a backup plan. Best regards, the Unique Property Bulletin team. Thank you to an alert reader, who emailed this property into us so we can share it with you. This is the Ark ever featured in the Unique Property Bulletin. Currently utilised as a barn, there is planning permission for an inspirational conversion of this large detached barn structure. Plans include five bedrooms and ample residential accommodation. All set in around 5.83 acres of picturesque Shropshire countryside. The Ark is based upon a traditional brick barn – thought to date from around 1880. Although not listed, the building is considered to have historic merit with its attractive air vent pattern, bow string roof trusses and unusual curved roof. 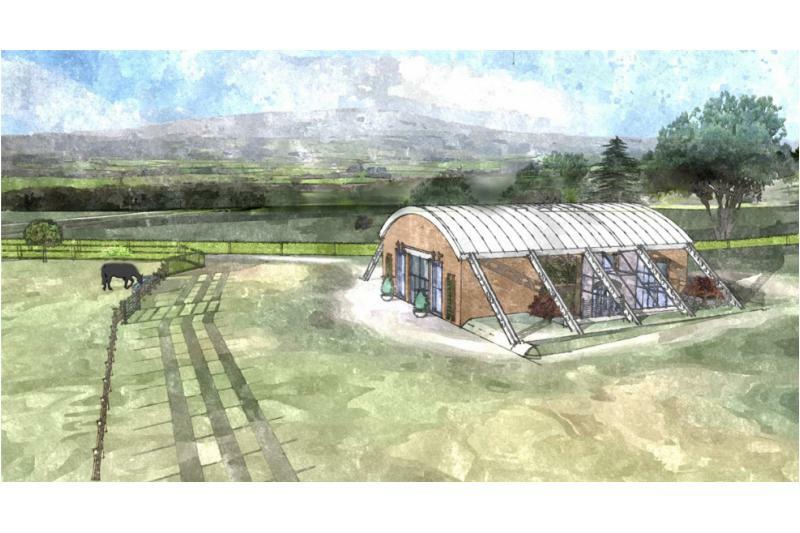 The proposed plans provide for the building to incorporate an independent steel frame with a new roof spanning over the existing trusses enveloping the current structure. There is further extension of the building with a sun room and garaging under the curved beams. Outside the 5.83 acres of land include about 3.88 acres that have consent for equestrian use and ideally suited for paddocks. 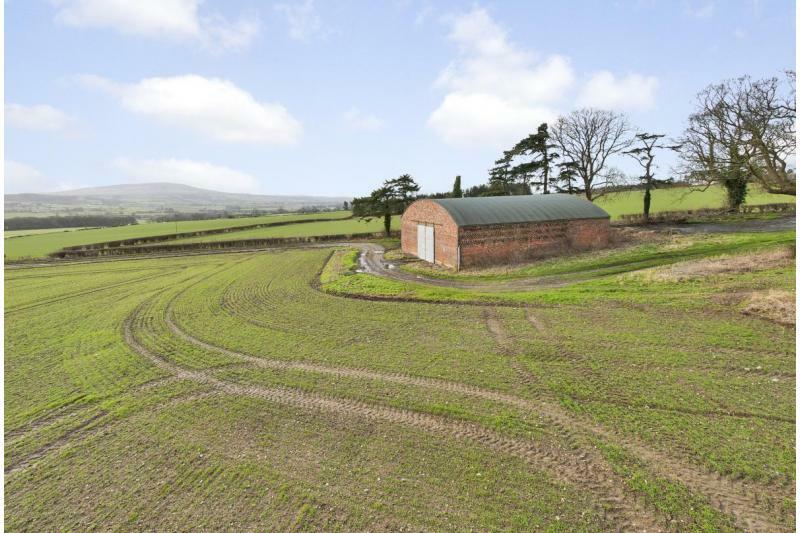 Planning consent was granted by Shropshire Council on 21st October 2015 under reference 14/04441/FUL for the conversion of agricultural building to one residential dwelling and change of use of adjoining land to provide for equine paddock. Associated drawings and documents are available on the Shropshire Council’s planning website or by request from the agent. Local towns and cities: Much Wenlock 3 ½ miles; Bridgnorth 11 miles; Shrewsbury 15 miles; Ludlow 18 miles; Birmingham 40 miles; M54 Junction 6 11 ½ miles; (all distances approximate and given in good faith). 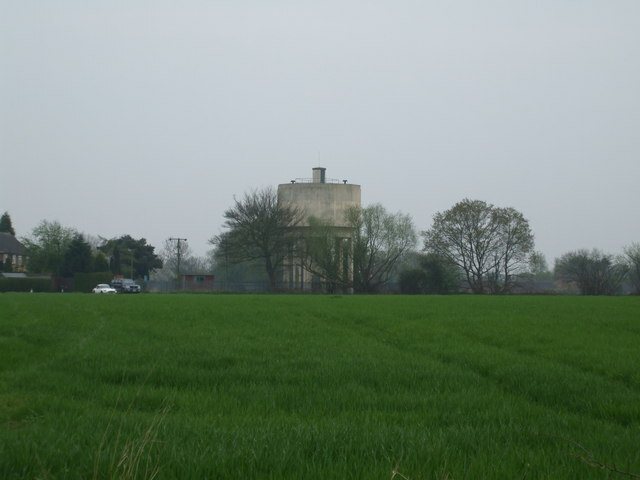 Guide: £280,000 – For the land and existing building. Newbuild/conversion costs NOT included. Contact Carter Jonas Tel: 01939 393112. Please can folk mention to estate agent that they found this place for sale in Unique Property Bulletin. This helps us keep this publication free for all readers. One of our promises is to help readers work out ways to fund their unique property. 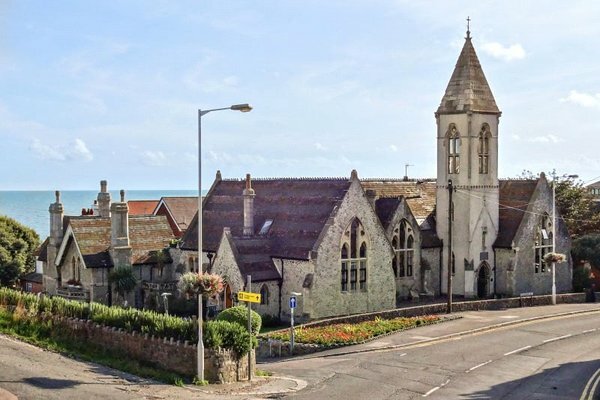 Quite a shift from a small house in the south east near London to this large, former lodge owned by the Duke of Argyll and converted into a 14 bedrooms hotel, owner’s accommodation plus 6 separate holiday chalets in the ample grounds and the magnificent Ocean views. It even had it’s own beach. It is worth contemplating those two steps to the sublime. Who could have imagined it? How many house moves are you away from that dream? Maybe spend an hour or so studying how this can happen. Not just at an eccentric publication such as Unique Property Bulletin and these odd syndicate adventures, but perhaps that can translate to your own circumstance. We would surely like to think so. There is a huge buzz here when a reader – a friend – eventually gets the keys to their own particular haven. So what about your eventual unique property purchase? It does not have to be an island. Indeed everyone has a different type of unique home that they are aiming to buy. A literal A to Z of unusual dwellings. 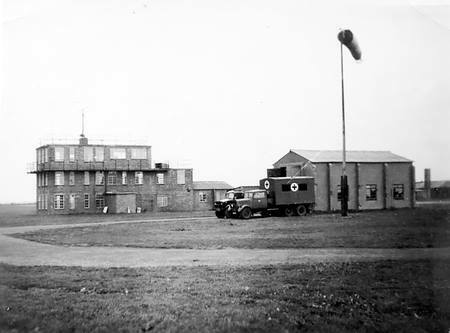 From air control tower conversions, through barns, castles, fire stations, martello towers, railways stations, signal boxes watermills, windmills, all the though to zoos. 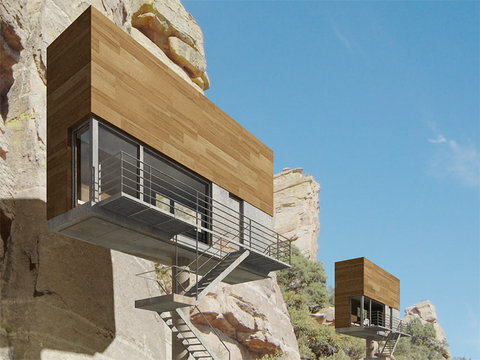 Go on, take an hour out of your day just to read how you might emulate this sort of adventure to fashion your own ultimate outcome of a unique home that you can eventually live in. Instead of just having a dream – consider making it a reality. Whatever kind of unusual home you aspire to, the funding element can be a key hurdle. If we can do it, surely you can too? Indeed around 111 folk are already ready on our email alert list to receive news of the next syndicate. Ullyett Cottage & Tower are part of a converted Victorian school building. 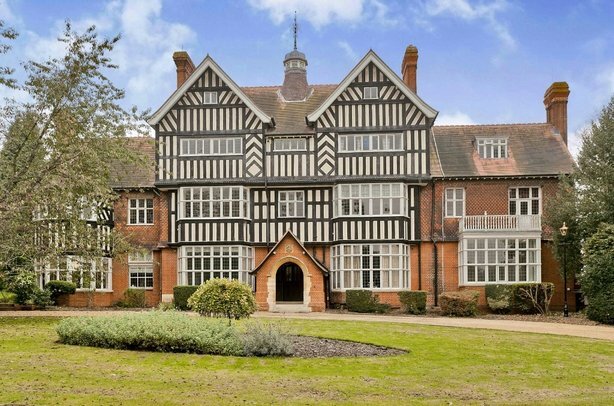 Within the property is the landmark Old School Tower, which is split over four levels. 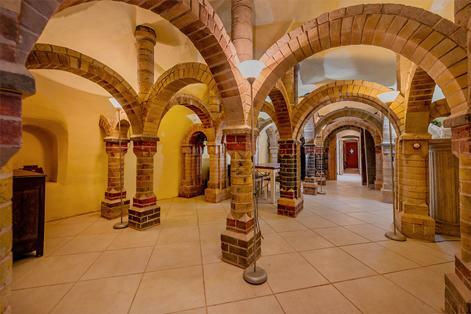 The property has a wealth of period features including a church style door opening into the entrance hall (base of the tower) which continues through to the open plan dining/study area. The well fitted kitchen sits neatly off the dining area; the utility room is accessed off the study area. Steps lead up to the wonderfully light sitting room. Stairs from the study area lead up to the 1st floor accommodation where there are two bedrooms (1 ensuite) and a further family bathroom. The tower is split over 4 levels. Each level provides a unique space. 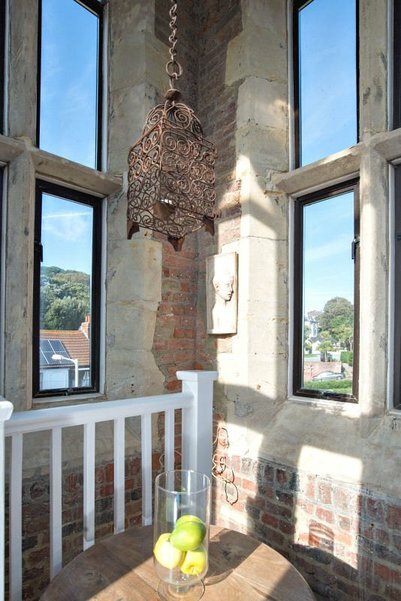 The top of the tower provides fabulous views out to sea and over Sandgate. 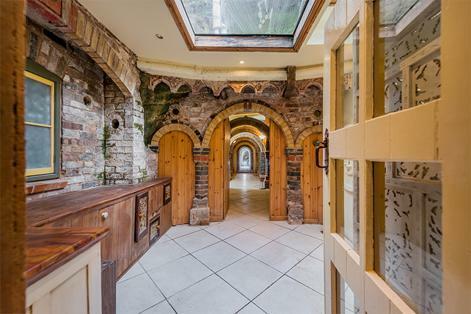 Ullyett Cottage has tall ceilings throughout, wonderful gothic-style windows and thick ragstone walls. The current owner is open to selling the majority of the fixtures, fittings and furnishings. Contact Strutt & Parker Tel: 01227 808744 – Pippa Cracknell. Please can folk mention to estate agents that they found this place for sale in Unique Property Bulletin. This helps us keep this publication free for all readers. Originally constructed in 1893, this visually commanding grade II listed building has an abundance of original features. Hidden, like a rare gem, behind private gates. 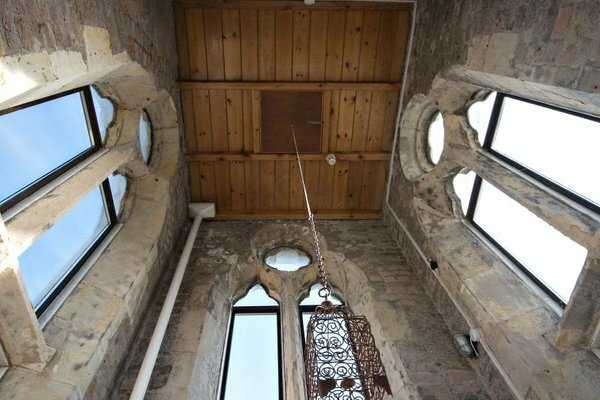 Within the apartment features include hand carved ceilings, lime stone fire place and even the old bells for the butler. A very nice website has been created to show each individual room within this fine apartment (click here). 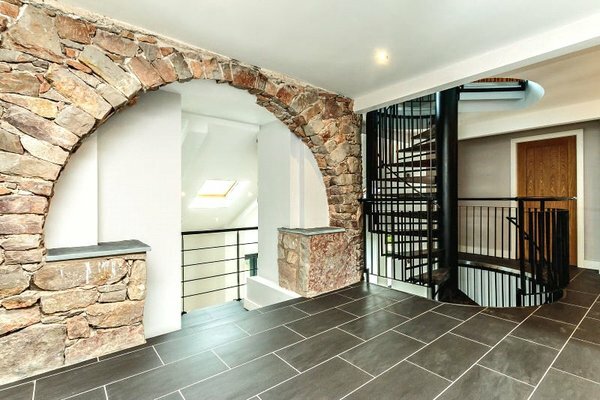 The property is accessed via the impressive communal hallway leading to the magnificent wooden doors which give you direct access to the apartment. Internally the property comprises the spacious lounge with grand limestone fire place and superb bay window overlooking the grounds. The modern fitted kitchen includes integrated appliances, a door onto the communal grounds and the current owners also have a small breakfast table. The bathroom is equipped with a bath and separate double shower an boasts a marble finish. The impressive master bedroom boasts herringbone parquet flooring, a bay window and fitted wardrobes. The second bedroom is a good size double also with the parquet flooring and is currently used as a study. Goddington Manor has good access to both Chelsfield and Orpington mainline train stations providing frequent services to London Bridge in only 18 minutes(from Orpington). Contact Unique Property Bulletin direct: Click Here. New Year and New Owners? Might You Want To Join In? We have received what may be exciting news regarding this beautiful island. For those readers that have not yet heard of the place, Tanera Mòr is the main island of the Summer Isles archipelago. 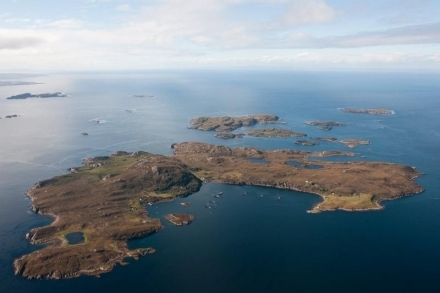 A group of rugged and exquisitely beautiful islands lying just 1.5 miles off the northwest coast of Scotland. 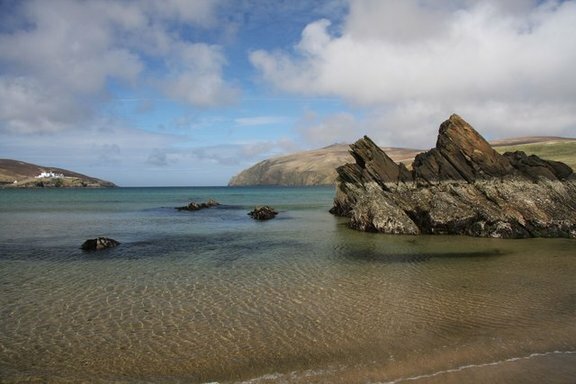 Tanera Mòr has a coastline of approximately seven miles encompassing numerous cliffs, coves and beaches; innumerable perfect picnic spots interspersed with fresh water lochans; and wonderful waters in which to swim, sail and fish. 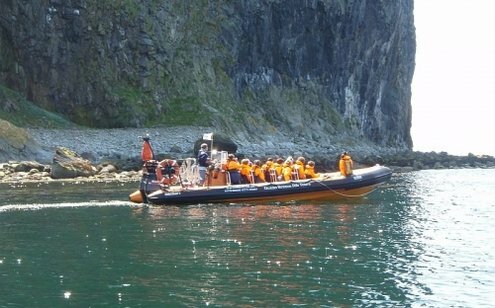 Access is via helicopter, or more usually a short boat journey from Badentarbat Pier or Old Dornie Harbour. 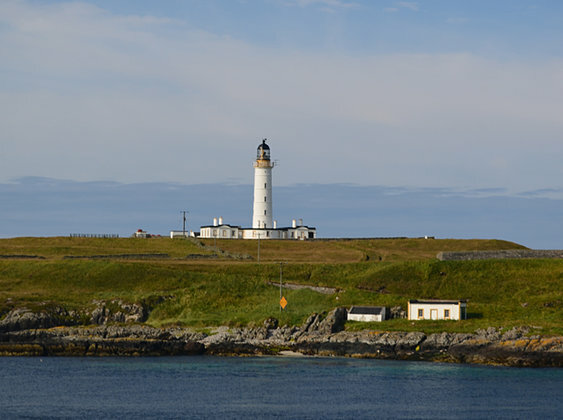 The pier is about 1.5 miles from the charming and popular west coast village of Achiltibuie. 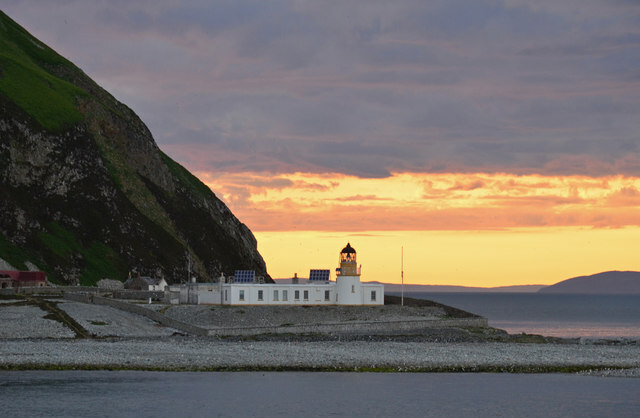 Alternatively, a larger vessel could be moored at Ullapool which lies 24 miles by road or 12 nautical miles to the south-east. As of 5th February 2016 we have now been advised that the proposed sale to a gentleman who had spent a lot of time and effort progressing a good way forward for the island, has fallen through and will not now go ahead. This is sad news. But even so, there is still the opportunity for individual houses to be purchased if we revert to the Bulletin’s earlier proposal of individual house sales via a Unique Property Syndicate. At the close of 2015 we had FOUR houses of the 9 with prospective syndicate members on board. If we can get to the number seven – a tipping point – then it may well be possible to manage a purchase of the island via the Bulletin. A case of watch this space. It pays to keep an eye on old editions of Unique Property Bulletin. Almost a year to the day this building was featured in a 2015 edition of our Bulletin for £1,075,000. 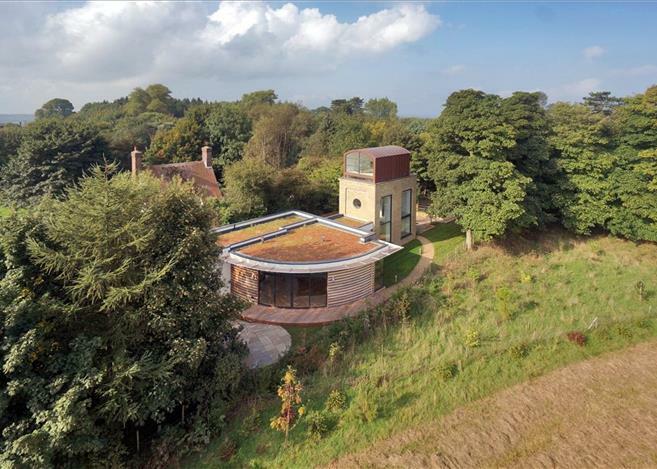 It had already been reduced from £1,195,000. 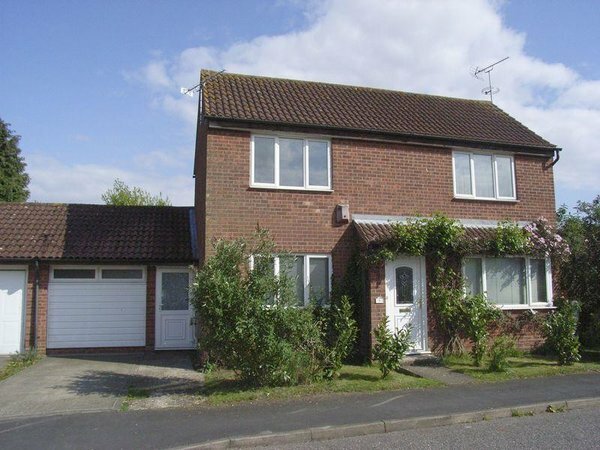 If you use the Unique Property Manual you would also have a nugget of information: this property sold in 2004 at £120,000. 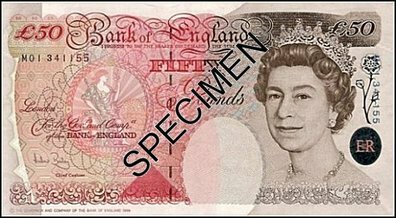 Factor in the conversion and refurbishment costs and where are we now? Well if you have been rummaging through the old online Bulletins and have this interesting home on your Radar, we can advise the new price is £925,000. A total of £270,000 has been shaved off of the original price. So far. We predict more haggle room: a new sale price beginning with an “8” and a final sale, perhaps starting with a “7”. In fact four important words currently adorn the latest estate agency details as far as the current £925,000 asking price is concerned. They are “in the region of”. 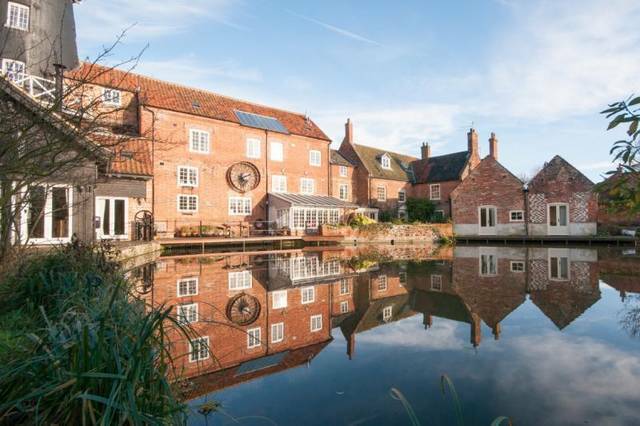 There may be a little more haggling if this beautiful conversion floats your boat. Earlier agency narrative: A relatively utilitarian – though with a slight architectural grandeur – for the water tower frontage. But there is so much more to this 1903 build edifice than we have pictured. Simply put we recommend Bulletin readers click the weblink below and look at the lovely photographs which illustrate the time, love and care in this exquisite transformation. The conversion and additions provide a reception room, master bedroom with delightful views, bathroom and further bedroom/study. The seller has created a fine single storey addition to the rear linked by a stunning full height entrance hall with spiral staircase. 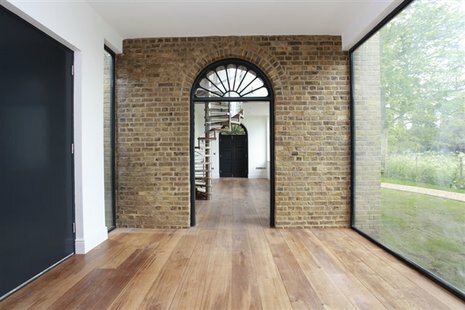 There is a large open plan kitchen/sitting/dining room with feature curved wall and feature glass corner wall. The units are from Germany. There are two further bedrooms and a bathroom. This really is a one off opportunity located on the highly sought-after Stede Hill. Archived Details: Click Here, and also Click Here. General Details Onsite: Click Here. 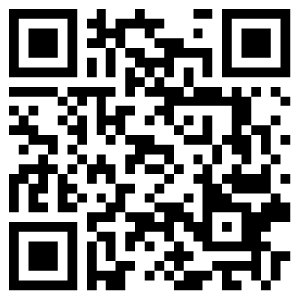 Contact: Click Here. PLEASE remember to identify which property you are contacting us about by inserting the identity of the building in question into the email SUBJECT LINE. Thank you. An award winning renovation of a Grade II Listed watermill into a stunning, romantic home where “True tranquility can only be found when the man made and the natural fit together harmoniously” – Nicholas Crane from BBC ‘In Search of England’s Green and Pleasant Land’. 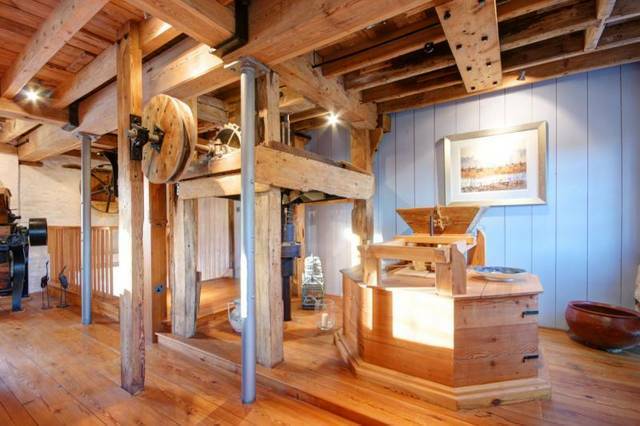 The Watermill is one of only around 500 remaining residential watermills in the country. 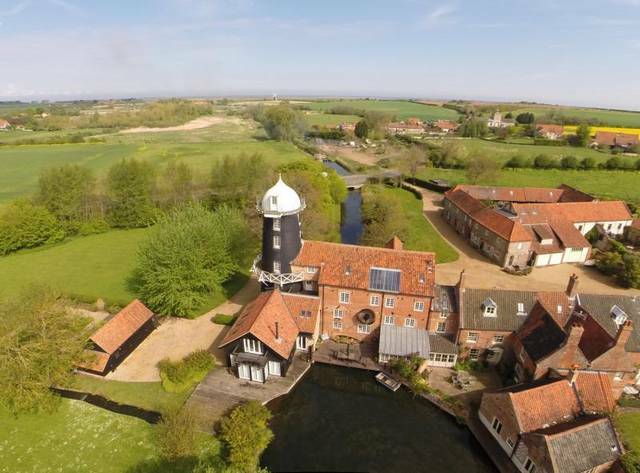 Built in circa 1737, it was also only one of two mills in Norfolk using both wind and water power in the same location. The Poncelet water wheel was still in operation grinding oats etc, in 1953. Fortunately all of the original machinery was left intact and has been restored and incorporated into the fascinating redesign of this beautiful, romantic home. The meticulous renovation took several years to complete using organic and original materials wherever possible> This included lime-wash, linseed paints, York stone tiled floors and pitch pine throughout. Living by the water on both sides means you are never far from the evocative sights and sounds of the mill pond and mill race. From the moment you enter the Watermill, you become aware of how special this renovation is. Every space has a unique offering from the beautiful bespoke Aga kitchen to the Boathouse, now a glass fronted dining area with all round waterside views and with a door leading out to the good-sized hardwood decking area for riverside entertaining. The first floor sitting room offers spectacular dual aspect views, a large wood burning stove, metal support columns and the original mill stones, still in working order for any new owner to take up producing their own flour. The original architectural and industrial features seamlessly blend history with everyday living. From the first floor study, a staircase leads to a large landing and 3 spacious bedrooms with beautifully appointed en suite bathrooms. The top floor boasts a second sitting room with large storage space and the 4th bedroom. The Watermill is approached off the Overy Road down a sweeping shared driveway. 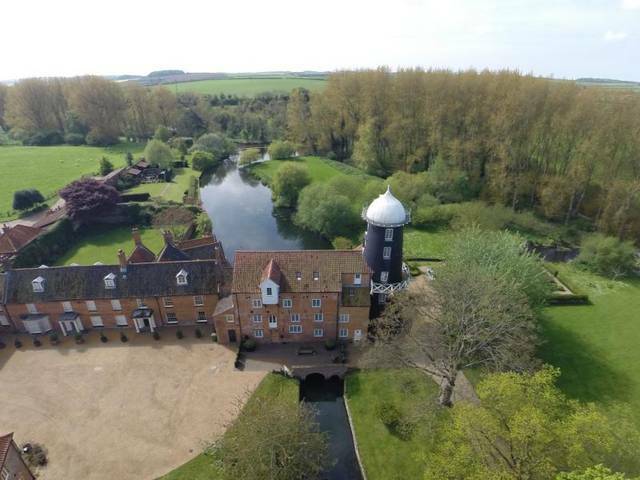 Close to the main entrance is a left fork leading to the approximate 4.75 acres of amenity land across water meadows, woodland and attractive river walks, shared exclusively with the residents of this small, prestigious complex of unique properties. A nominal yearly charge is made through the property management company for the upkeep of the shared land. 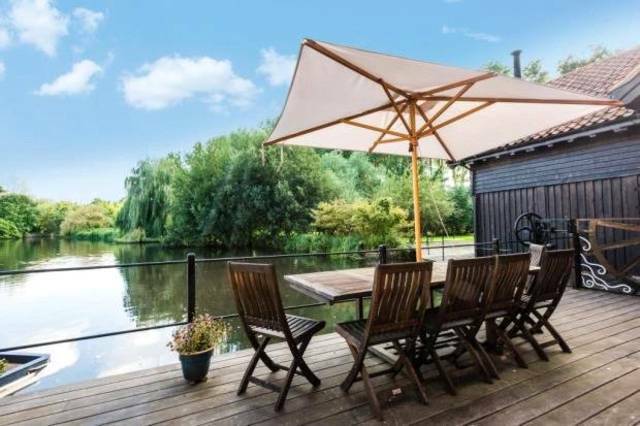 Also off this track and available separately is a recently built oak framed barn with 3 sets of double doors and about 0.6 acres of garden where the current owners have converted an historic railway wagon into a comfortable summerhouse. Contact Jackson-Stops & Staffs Tel: 01328 801333. Please can folk mention to estate agents that they found this place for sale in Unique Property Bulletin. This helps us keep this publication free for all readers. 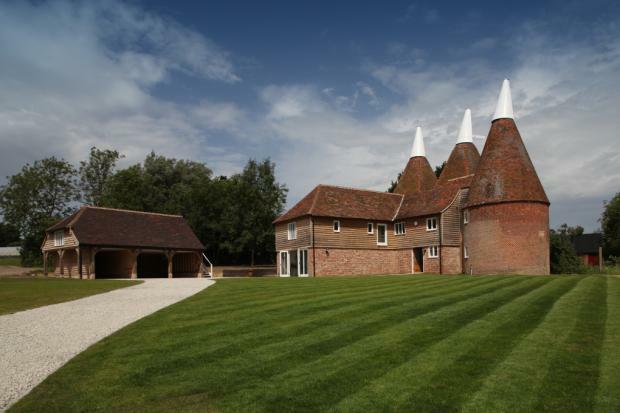 These former oast towers are fairly rare – though invariably popular with our reader who seek a home which has something special brewing about it. 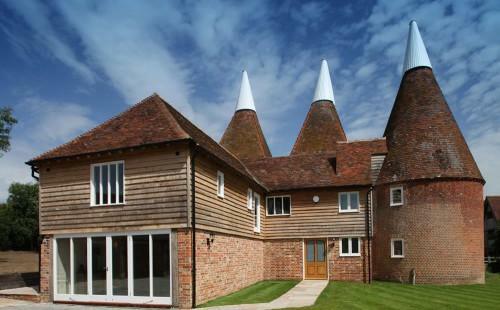 Little Halden Oast House is a substantial Grade II Listed property, believed to date back to the Jacobean era circa 1603. The structure has been added to over the years and is converted to a very high standard by the present owners. 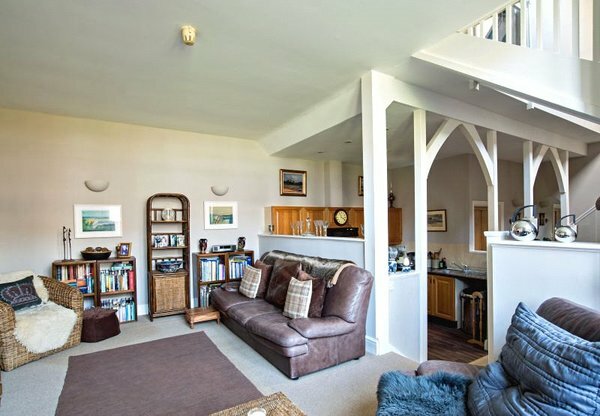 This beautiful property provides light and spacious accommodation with modern interior and decoration whilst retaining its original charm and character with exposed oak beams and high ceilings throughout. 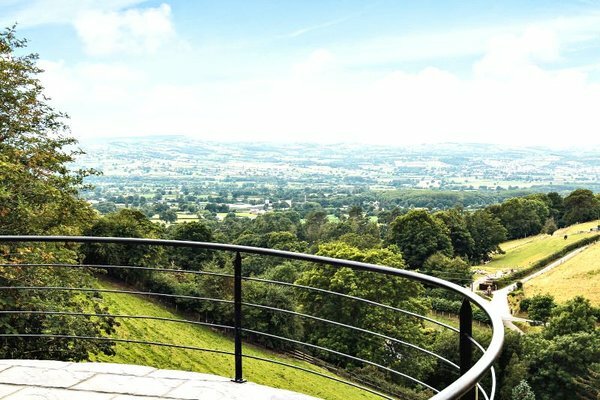 Occupying a secluded position in approximately 0.52 of an acre with panoramic views over farmland. Approached via a long sweeping lane. Guide- Was: £1,800,000 (click here). Now: £1,095,000. A saving of £705,000. Nice thank you. Contact Strutt and Parker Tel: 01227 807946. Please can folk mention to estate agents that they found this place for sale in Unique Property Bulletin. This helps us keep this publication free for all readers. This architect designed home provides a light and airy accommodation set over three floors. It is contemporary throughout with top of the range fixtures and fittings including a sleek Miele kitchen and a cinema room with ceiling mounted 3D projector and motorised projection screen. 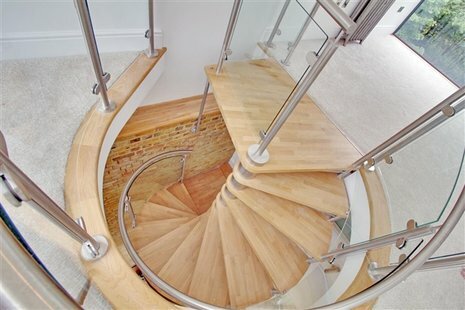 The versatile open-plan reception room comprises living, family and dining areas and taking centre stage is a stylish bespoke spiral staircase with beautiful beech treads. 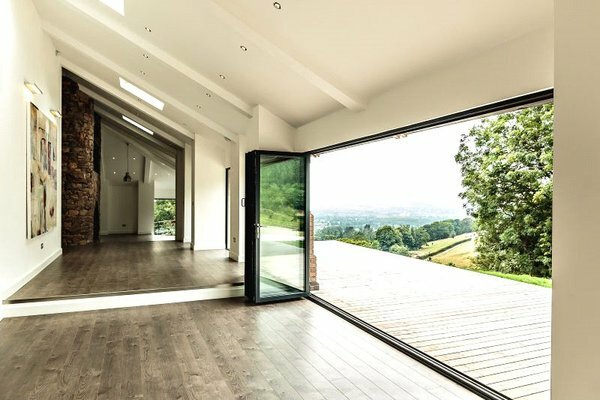 Bi-folding doors lead out onto a decked veranda and when fully opened transforms this space by creating a natural flow of inside and outside living. On a lower level is an impressive exposed stone chimney breast which encompasses a double-sided open fireplace. A south-westerly facing balcony is another highlight and enjoys incredible far-reaching views, providing a perfect retreat with complete solitude. Victor Frankenstein – Movie Location Click Here. Over recent months there have been some devastating floods. As a result of this subject featuring more and more – especially in headline news, we believe there will be a slow, but sure movement towards future-proofing newbuild houses to provide inbuilt resilience to flooding risks. One particular design firm has caught our eye. Front Architects appear to be contributing to that important vernacular in an elegant way. 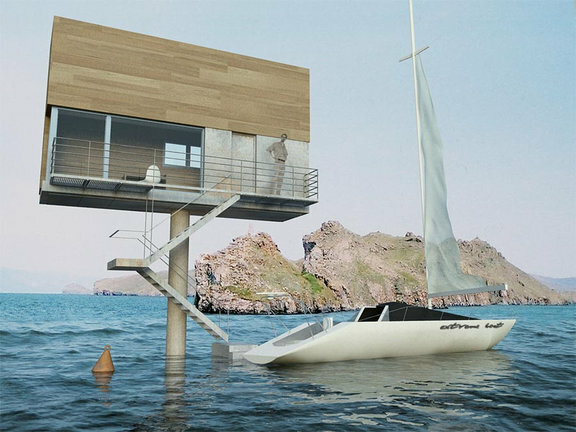 Whilst our favourite location of this design is the house on a pole in the water, his style of house can be situated in many unusual locations. Normally Unique Property Bulletin stays within the shores of the UK. Sometimes though, a building is so exceptional that it transcends borders. We believe this is one such case: Ashford Castle at County Mayo in Ireland. Our recommendation for a try-before-you-buy experience in this edition of the Bulletin is Ashford Castle. 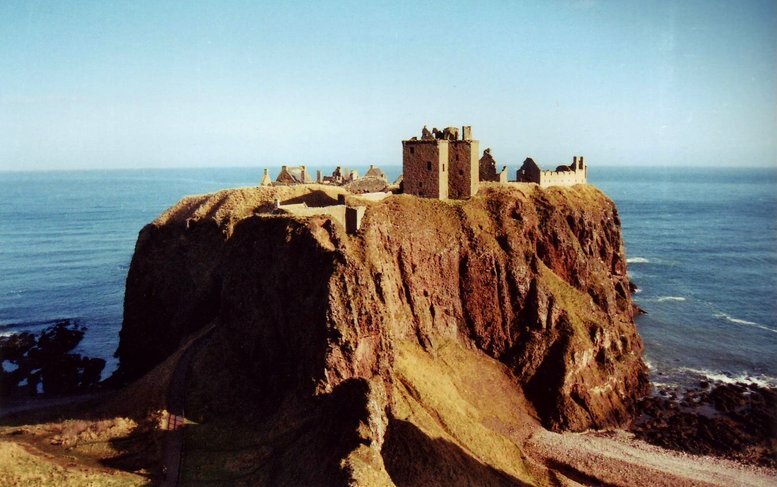 This building will not be for sale any time soon, but it certainly can give some inspiration if you are looking to renovate your own castle purchase. Don’t worry, these three gentlemen are not the Garda Siochana come to hustle you away. 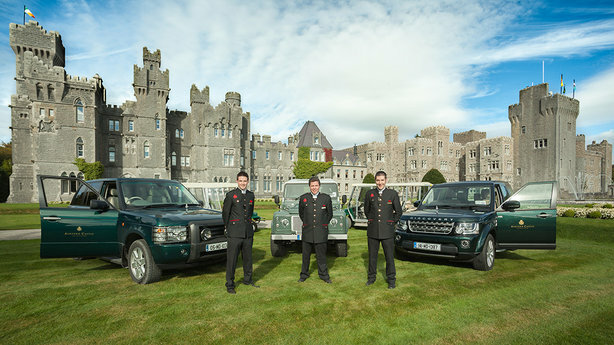 Rather part of the luxury 5 star service at this splendid castle in Eire – including a nice range of hotel transport. As well as being am impressive building, Ashford Castle comes with some star-dust in the history department. Holywood style. In 1951, the film director John Ford came to the west of Ireland to film The Quiet Man, starring John Wayne and Maureen O’Hara. The grounds of the castle, as well as nearby Cong, formed the backdrop for much of the action in the movie. This film was Ford’s first ‘romantic love story,’ received a total of seven Academy Awards nominations, including Best Picture, Best Supporting Actor, Best Screenplay, Best Art Direction and Best Sound. On the day, this film won two Oscars: Best Cinematography and the ultimate – Best Director Oscar for John Ford, establishing a record that is still unbeaten. Contact Tel: 0353 94 954 6003. Please can folk mention to estate agents that they found this place for sale in Unique Property Bulletin. This helps us keep this publication free for all readers. It is not yet official. You heard it here first. For this edition of the Unique Property Bulletin we have a fairly short feature. That is kind of the point. The challenge is handed to you, our reader. If you can solve this…. How Good Are You At Solving Puzzles? Despite the lighthouse tower that was for sale on the front cover this book, our manual is written for EVERY genre of unusual property that could or can be considered competent for conversion onto a residential dwelling: your ideal home. 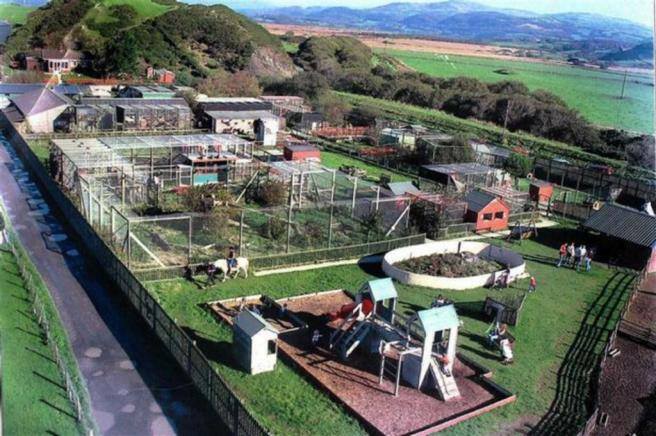 Your choice: Air Control Tower, Barn, Castle, Distillery, Fort, Island – right through the alphabet to an actual Zoo. Yup we have featured a couple of those too. 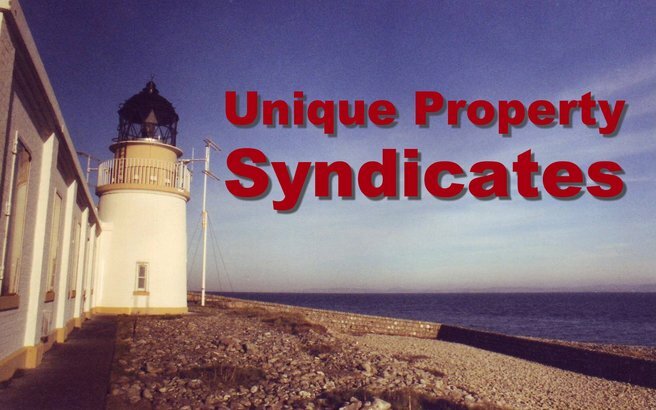 So if you are looking to find and fund that elusive unique home, plus obtain the vitally important advantage of several months advance notice that such properties are coming onto the sale market BEFORE anyone else even knows, please consider buying one of the last remaining copies of Unique Property Bulletin. There are just 80 of these books left. So what about that secret property for sale? In fact we were officially advised that there are several. We have featured a couple of them here on the island of Islay. 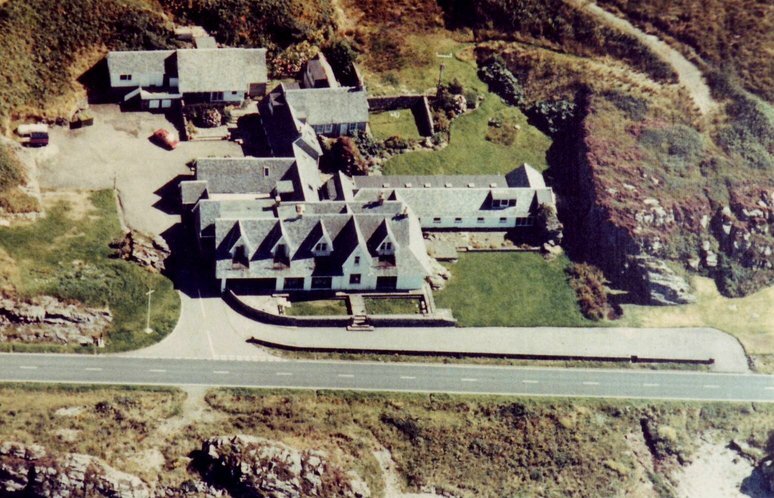 The lighthouse keepers’ homes at Rinns as pictured above, happen to be just two of several that we now know are coming up for sale. But VERY FEW other buyers are aware of these yet. 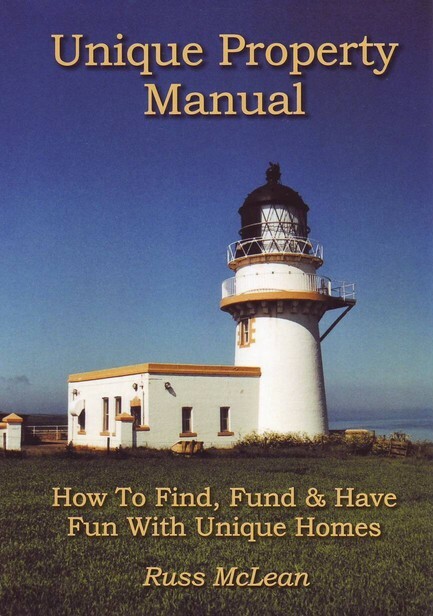 If you acquire a copy of the Unique Property Manual now, we will include a covering letter listing another tasty lighthouse building that isn’t currently advertised, but will be coming up for sale. It is at an iconic place with several dozen acres of spectacular land included as well. 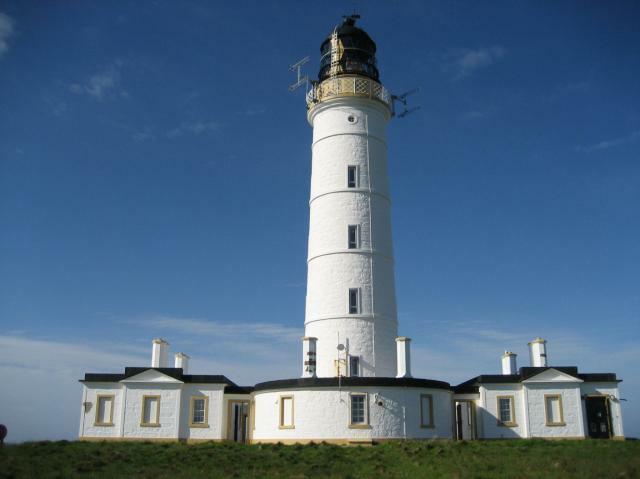 There are regular new additions such as the wonderfully named Muckle Flugga lighthouse keeper’s dwelling at £90,000. Just checked – it’s come down £5,000 and is currently at £85,000. Watch this space: click here. 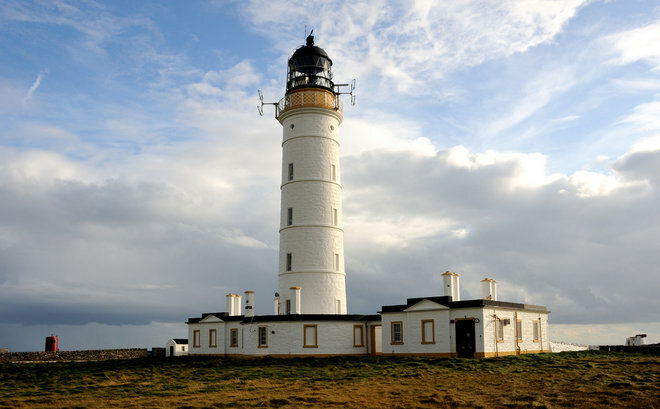 Though even if you aren’t that keen on lighthouse buildings, the Unique Property Manual really does cover the A to Z of the majority of other styles that folk look to create a distinctive home within. We had the grace of time and that tipped the scales of fortune, enabling a group of Unique Property Bulletin readers and friends to end up owning a private island lighthouse compound. What a wonderful adventure that was. Next Full Edition At 9pm, 28 February 2016. Just finishing off writing this edition of Unique Property Bulletin and in the background the radio is playing that great Ben E. King song Stand By Me – which by the way 26,371,404 other people seem to enjoy too. Couldn’t help but think of the final scene in the film of the same name where Richard Dreyfuss gets lost in the words on his computer. Something resonated with that. I love this Unique Property Bulletin. I love the people who read it. I love the kind and interesting emails from readers and friends, which now take a regular slot between 7am to 11am each day to reply to (please keep the emails coming). I can get so immersed here that hours go by compiling an edition of the Bulletin. It is an amazing and enjoyable reverie. Strange how things work out. I used to think email was the work of the Devil and hated computers. Now that loathing of technology has transformed. Maybe something to do with recently joining that other computer based bête noire. Dragged kicking and screaming onto Facebook Bulletin. Far from being the terrible thing I thought, it turns out that Facebook Bulletin has helped me to find long lost friends, where empty spaces in my life had long persisted like an ache in the soul. Just words on a screen. But I will never cease the amazement at what the simplest of words can do. How about you?